But is it worth £649? Update: Arriving a couple of days later than expected, Samsung has confirmed the Galaxy Note Pro 12.2 will touch down in stores on February 6. The Korean firm has also announced that its new Galaxy Tab Pro series (comprising of a 12.2-inch, 10.1-inch and 8.4-inch tablet) will arrive later this quarter - basically before the end of March. If you so desire, Samsung will now set aside one of its man-bag busting Galaxy Note Pro 12.2 tablets on your behalf, ahead of its official February 4 shipping date. The super high-end tablet, revealed at CES earlier this month, will cost a significant £649, but the first 300 pre-order customers will earn themselves a Samsung GamePad, worth £90, for their troubles. Users snapping up the Wi-Fi only version will get the octa-core Exynos 5 processor, while those who require mobile data will have to 'settle' for the quad-core Qualcomm Snapdragon 800 SoC. The device also brings into play a brand new 'Magazine UX' user interface slapped over Android 4.4 KitKat, which spreads multiple widgets across the page in a Flipboard-style layout. The Galaxy Note Pro 12.2 was announced alongside the Galaxy Tab Pro 12.2 in Las Vegas. 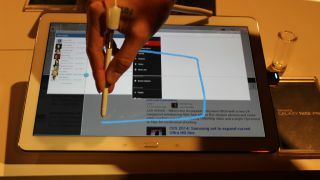 Essentially the only difference between the two is the addition of an S-Pen with the former. The Tab Pro range also includes 8.4- and 10.1-inch options. However, Samsung is yet to announce UK pricing and availability. Speaking of Notes, the Samsung Galaxy Note 3 Neo has been officially confirmed, but apparently, it ain't coming to the UK.